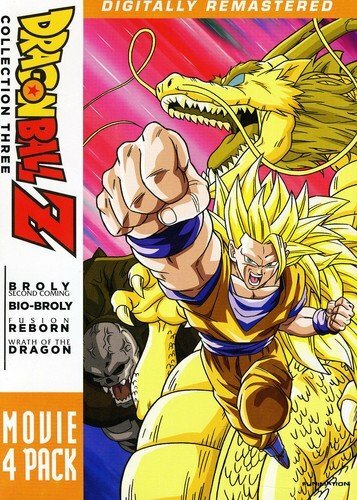 Treat yourself to a night at the movies with the Dragon Ball Z Film Collection Three! This epic collection – featuring films ten through thirteen – is the final step in your quest to attain every DBZ movie ever made! The Dragon Ball Z Film Collection Three: more action than you can handle! Broly’s Second Coming:An investigation into the crash of a strange vessel quickly turns into a battle that not even Earth’s most powerful heroes are guaranteed to win. Broly, one of the greatest evils in existence, is back to wreak havoc on humanity! Only this time, Goku may be powerless to stop him! Bio-Broly:Corruption and technology combine to resurrect one of the greatest evils the universe has ever known. Broly is back and more deadly than ever! The sinister Super Saiyan appears to be unstoppable until Trunks discovers a secret that could stop the symbiotic scourge! Unfortunately, it might be too late to prevent Earth’s ultimate day of reckoning. Fusion Reborn:An industrial disaster in Other World unleashes the monstrous Janemba, a beast who grows stronger with each passing minute. While Goku and Vegeta fight for Other World's survival, Goten and Trunks confront a ghoulish army of the undead back on Earth. A dangerous plan of attack is devised, and only an unprecedented act of teamwork can save the universe! Wrath of the Dragon:Dark magic has unleashed an ancient monster - Hirudegarn - that consumes both flesh and soul. As the beast rampages on Earth, its power threatens to increase to unthinkable levels. Such wickedness can only be defeated by Tapion, a man who has already given so much – and who will now offer his own life to save the universe.